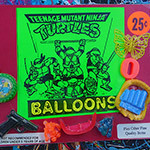 Ninja Turtles Cracker Topper! | Dinosaur Dracula! 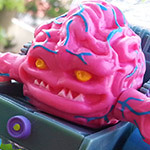 Let’s kick this baby off with a photo of Krang, dressed like a soft serve ice cream cone. But it isn’t soft serve ice cream. It’s mofuggin’ Easy Cheese. Side note: Mondo Gecko’s tongue has always bothered me. It looks like he’s biting it. 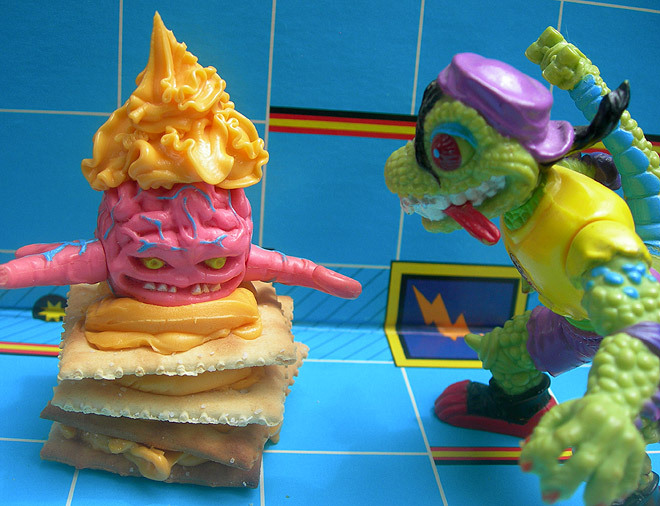 I admit that diving straight into Krang smothered with cheese might be construed as “too random,” but I had every reason to do this. See, last December, a reader named Mike mailed me a box of “food items” (empty cereal boxes, mainly) that he was having trouble selling on eBay. 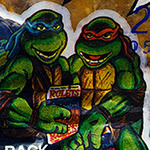 Deep within that box was a peculiar item that appeared to be shaped like Leonardo’s head. 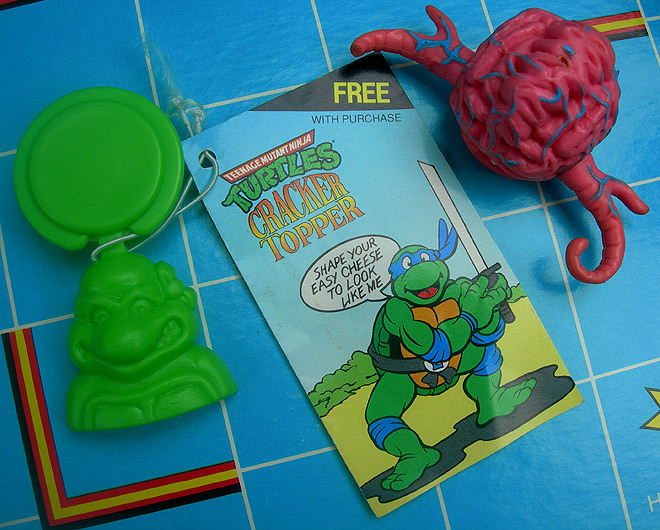 It was the official Teenage Mutant Ninja Turtles Cracker Topper, a freebie packaged with cans of Easy Cheese back in 1991. Oh, Leonardo. I can’t tell you how long I’ve been waiting to hear you say that. The fact that you said it in the midst of a katana training session makes it that much merrier. 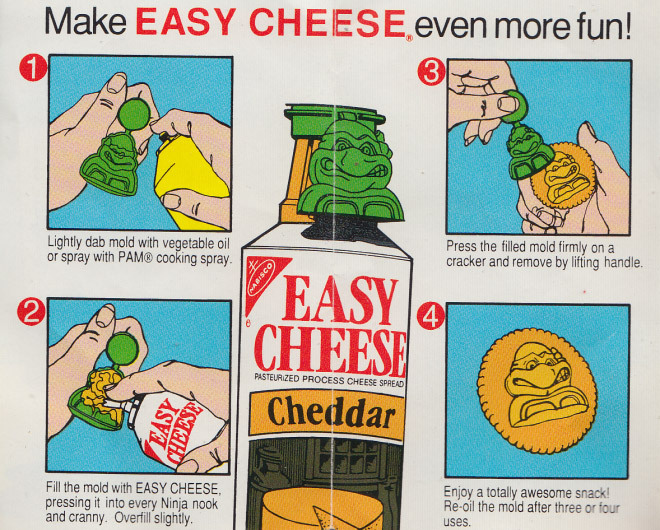 This is inarguably better than 99% of the world’s other molds, because you’re supposed to fill it with Easy Cheese. 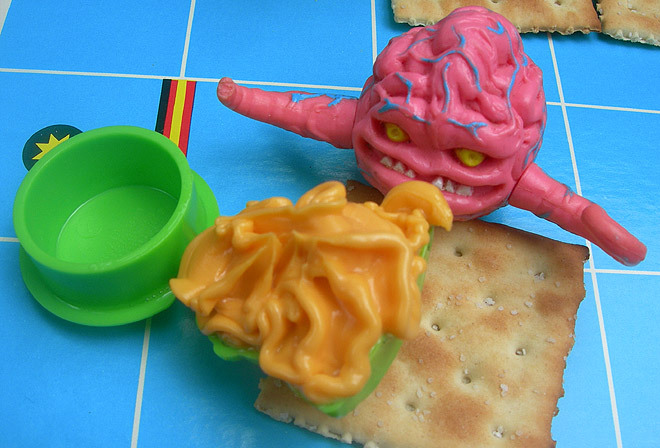 You’re filling a Ninja Turtle head with cheese, guys. The only thing guaranteed to be on the bucket list of anyone you ask. The instructions encouraged me to “overfill slightly,” so I did. The issue is that “slightly” leaves perhaps too much open to interpretation. I had a feeling that I was going overboard on the Easy Cheese, because I can’t remember a time when I didn’t go overboard on the Easy Cheese. It’s as close to a birthright as anything involving cheese can be. 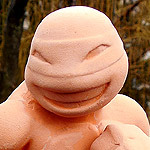 I refused to believe that the one time I had to hold back was when I filling a Ninja Turtle head. Seems wrong, and cruel. Yup, just as I suspected. Too much cheese. This would only work if I was trying to present Leonardo as an overindulgent king, wearing a robe with the gaudiest fuzzy collar. 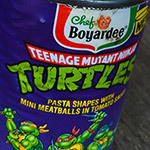 I could see that on Donatello, but Leo is too minimalist. Subsequent attempts came out better. I’m totally flipping out. 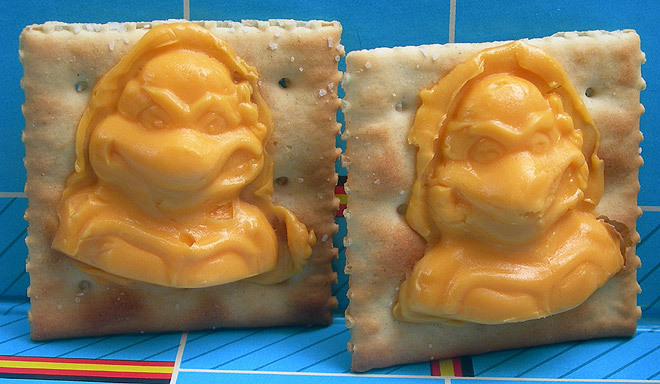 I can make Turtle-shaped cheese piles whenever I want. I finally understand the point of Splinter’s many zen rants. I can’t believe this slipped by me in ’91. I would have been all over it. 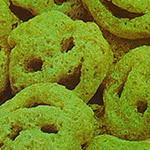 I’d have invited my friends over and spent all morning making them TMNT cheese crackers, never once admitting that I was already too old to be doing that. Let it be known that today was a good but secretly stressful day, and for whatever it’s worth, making Leo cheese was by far its highlight.